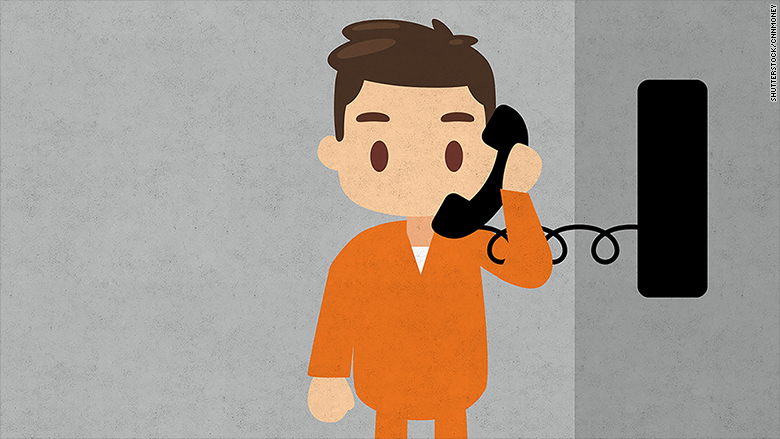 Staying in touch with loved ones who are in prison just got a lot more affordable. The Federal Communications Commission ruled Thursday to cap the cost of phone calls made between prisoners and their families. It's meant to address what has become the exorbitant cost of prison phone calls, which can cost as much as $14 a minute, according to the commission. The calls have become so pricey because most prisons offer exclusive deals to phone service providers in exchange for astronomical commissions. The new ruling by the FCC will put an end to this by capping the cost of local and long distance calls. The consumer rights group Public Knowledge applauded the FCC's decision. "For 15 years, families of those held in our overflowing prisons have been subjected to punishingly high rates from monopoly phone providers," said Harold Feld, an executive with the group. "This policy benefits no one but the monopoly providers, often forcing poverty-stricken families to choose between paying their bills or staying in touch with their loved ones." In a statement, the FCC detailed the new caps, which will be tiered based on whether the institution is a prison or jail. Calls will now be capped at 11 cents a minute for all local and long distance calls from state and federal prisons. In jails, prices will range from 14 cents to 22 cents a minute, depending on the size of the institution. The FCC noted that sustained contact between inmates and their loved ones tends to reduce recidivism rates, but that the high cost of calls had made this contact difficult. The ruling bans flat-rate calling and makes phone calls accessible to people with disabilities. It also closes loopholes and bars add-on fees and service charges. The cost of collect calls will also be capped during a two-year transition process. FCC Commissioner Mignon Clyburn has been a vocal advocate of the phone rate cap and said she was proud of the FCC ruling. "In a nation as great as ours, there is no legitimate reason why anyone else should ever again be forced to make these levels of sacrifices, to stay connected, particularly those -- who make up the majority in these cases -who can least afford it," Clyburn said. "The system is inequitable, it has preyed on our most vulnerable for too long, families are being further torn apart, and the cycle of poverty is being perpetuated." Clyburn added that "incarceration is a family matter, an economic matter, a societal matter" and said those most affect by incarceration are often "the loved ones who are left behind." Thursday's ruling expanded on steps the FCC took in 2013 to cap some calls at 21 cents a minute. The new caps will not take effect immediately -- they must first be published in the Federal Register. Ninety days after publication, they will be instated in prisons and six months after publication, they will take effect in jails.